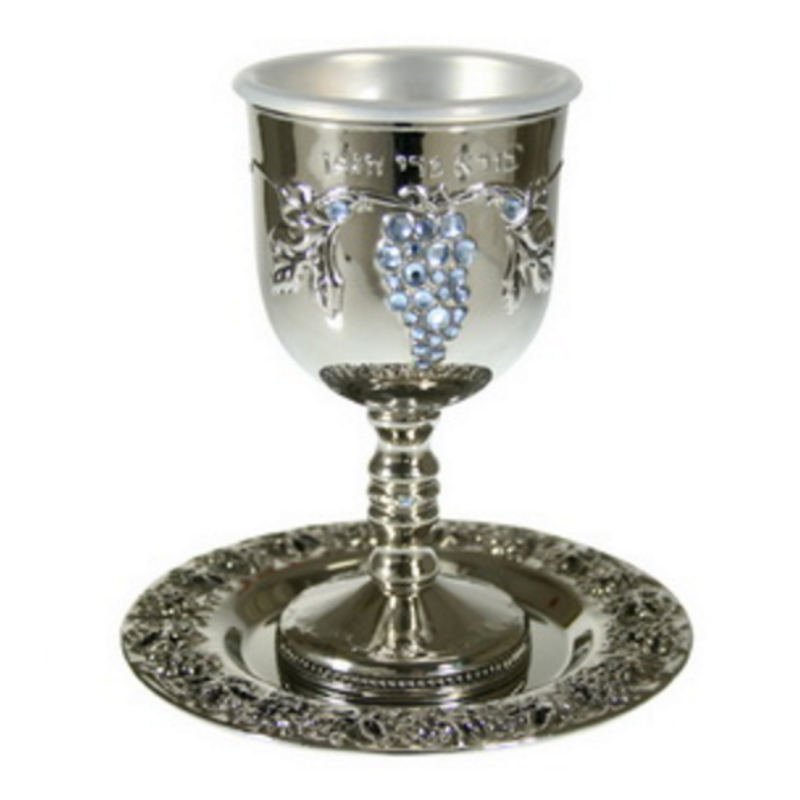 Beautiful Judaica Kiddush cup for Shabbat and Yom Tov, with grape vine-inspired designs and dainty, light blue stones set in the shape of grape clusters. This distinctive goblet comes with a reusable plastic liner, and a matching grape vine saucer. This Kiddush goblet has fine detailing, with dainty grape vine patterns and delicate light blue stones set in the shape of a grape cluster, reminiscent of the grapes used to produce kosher Kiddush wine. A single blue gem is set in the wavy goblet stem, and the goblet’s bowl is embossed with the Hebrew phrase “borei pri hagafen,” from the Kiddush blessing over wine. Truly a distinctive Judaica addition to any Shabbat table! The ritual of Kiddush is recited every Shabbos, as well on other Jewish holidays throughout the year, before beginning the festive meals. In a synagogue Kiddush, the prayer is usually recited by the congregation’s rabbi. At home, the head of a household usually recites Kiddush for the family and any guests present. Wine, poured into a beautiful goblet befitting the holiness and splendor of the ritual, is traditionally used for the blessings, although plain grape juice is an accepted alternative.